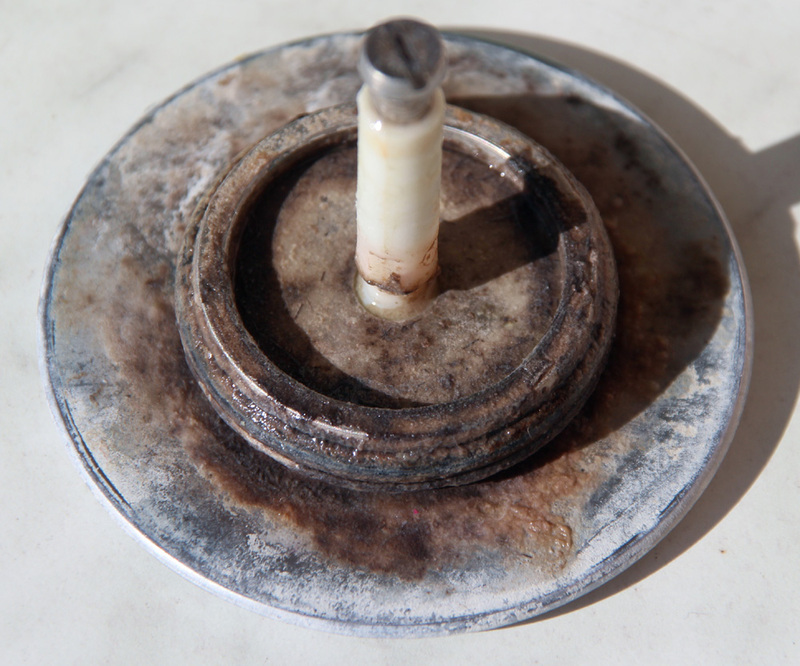 A possible health hazard: Biofilm on the underside of a bathtub stopper. Much has already been said and written about the precautions that one should take when dealing with organic solvents, fixatives, and stains, which are needed for preparing microscopic specimens. Organic solvents (such as xylene) can be inhaled and many volatiles pass easily through the mucous membranes into the blood. Certain fixatives will react with substances in the cells, where they may denature proteins and cause a wide range of other chemical modifications. Stains can be a particular problem, especially if these interact with the DNA of the organisms, as used for making nuclei visible. In this case the stains may be cancer-causing. As a matter of fact, some more traditional substances used in microscopy, such as Hoyer’s mounting medium, contain ingredients that are addictive and are a controlled substance and are therefore not freely available. Much less has been written about the precautions that one should take when dealing with the organisms themselves. It is now my objective to address some precautionary measures when dealing with organisms that are to be microscoped. Amateur microscopy certainly can not be considered a high-risk hobby, especially when one looks at ready-made permanent slides. Here the organisms in question safely killed and embedded in mounting medium. The issue starts to look a little different when one engages in collecting, concentrating and possibly even growing microorganisms for microscopic observation. Safety issues like this are not only relevant to amateur microscopists, but also for teachers who want to conduct basic microbiological and microscopic work in a school laboratory. In this case the organisms are alive and depending on the type of organism, they may pose a possible health hazard. It it not, and can not be the intention of this article to give a detailed overview of the aseptic procedures used in a microbiology laboratory. I am not going to address the growing of bacterial colonies on agar petri dishes or the the making of a nutrient broth for the enrichment of bacteria. I am also not going to address the proper use of an inoculation loop and a Bunsen burner for sterile colony transfer. These laboratory methods are, in my opinion, too specific for the majority of amateur microscopists and require a properly equipped lab and appropriate training. Such issues can also not be covered in the little space available. The growth of (unknown) bacteria on agar plates or liquid culture medium also poses a potential health hazard, as the bacterial densities can be extremely high, and I generally would be cautious when working with nutrient media. There are also legal issues associated with these methods, as the legislation of some countries only permit the enrichment and growth of bacteria for certified laboratories. As a matter of fact, the growth of unknown bacteria isolated form the environment even requires the application of aspetic methods of an elevated biohazard level. Readers who are interested in these methods should consult introductory microbiology books, which cover these aspects in detail. Rather, I would like to place a focus on the methods that are relevant for microscopists. In particular, I would like to address the making of a hay infusion, the observation of pond water as well as the observation of molds and other fungi. The term aseptic technique refers to a medical or laboratory procedure that is performed under sterile conditions. The aseptic technique fulfils several objectives. First, the technique should protect the sample under investigation from contamination. This is of particular importance when culturing microorganisms, as fast-growing contaminants may possibly grow faster than the microorganism that one is interested in. The sample may thus quickly become overgrown by unwanted microorganisms. While still working in a microbiology lab, I was told that a student working towards his diploma thesis accidentally sub-cultured a contaminant for several months. All of the experimental tests were performed on this contaminant and at the end of the thesis work the obtained data of several months was considered worthless. A quick check of the microorganism under the microscope would have quickly revealed the mix-up. For those of you who were wondering: Luckily I was not the unfortunate student. Second, the aseptic technique should protect oneself from infection by potentially pathogenic microorganisms. The procedure therefore includes measures that prevent the inhalation of microorganism containing aerosols as well as the prevention of skin contact and ingestion. Last, the environment and other people should be protected as well. Proper disposal of petri dishes and microorganism-containing sample materials is therefore necessary and often also required by law. Immune status of the person: The weaker the immune system of the person, the higher the chance of contacting an infection. For this reason, only handle unknown bacteria if you are healthy and have no immune system problems. Infectivity of the organism: Some pathogens can be infective at a low concentration, others require a higher concentration. Keep the concentration of the microorganisms low. Density of the organism: The higher the density, the higher the chance that a critical level of the microorganism is reached to cause infection. Just as above, keep the density of the microorganisms low and only grow them if it is not possible to observe them from natural samples. Mode of transmission: Different pathogens prefer a different method of transmission. Certain pathogens, for example, are transmitted over the air, others over water and still others over food. Others require insect vectors for transmission. Most microorganisms are harmless, but one never knows what substances they are producing when grown at a higher concentration. Certain Cyanobacteria, for example, are known to cause eye irritations or allergies. A hay infusion is a culture medium which is commonly used to grow protists, such as the well-known Paramecium, for microscopic observation. Hay infusions have been popular since the beginning days of microscopy and are still a popular way of obtaining protozoa for educational uses in schools and universities. There are two ways in which a hay infusion can be made. A handful of hay is boiled with water to extract nutrients, which serve as a food source for the microorganisms. The obtained culture medium must then be inoculated with the microorganisms that one wants to enrich. Pond water containing ciliates, for example, can be used. Generally this procedure is not recommended, as heat-resistant spored of potentially pathogenic bacteria can survive the boiling process. Alternatively one can try to enrich the microorganisms that can be naturally found on the hay. In this case the hay-water mixture is not boiled, but simply left standing for 24-48 hours. A thin iridescent bio-film will start to form on the water surface. This film is teeming with bacteria. In the presence of ciliates, the number of bacteria may decrease over time, and a progression of different organisms can be observed. Be aware that some countries have laws that regulate the use of hay infusions (and growth ob bacteria in general) for educational purposes. One should be aware that unknown (and therefore potentially pathogenic) microorganisms may also start to grow in the hay infusion. The boiling process does not necessarily kill all of the microorganisms present on the hay. It is not uncommon to find heat-resistant spores of Bacillus and Clostridium on the hay. After the cooling of the infusion, these spores may start to germinate giving rise to live, possibly pathogenic, bacteria. The fact is, that you simply do not know what you are growing and appropriate safety precautions should be taken. It is not possible to determine the pathogenicity of bacteria by microscopic observation. A range of biochemical and genetic tests are necessary. The enthusiast microscopist should therefore treat such a hay infusion with utmost care. Do not ingest the hay infusion, avoid skin contact (especially if there are open wounds), do not inhale the aerosols and prevent spills. Generally avoid contact of the liquid with mucous membranes, including the eye. Also make sure that the hay is clean and has not been in contact with excrements of animals. You may otherwise enrich bacteria from the animal’s digestive system. If a spillage or skin contact has occurred, then use 70% ethanol for disinfection (mix 7 parts of alcohol with 3 parts of water). A higher concentration of alcohol may actually have a lower disinfection efficiency. Do not simply flush the hay infusion down the toilet. This may cause aerosol formation. Add chlorine bleach to the infusion and allow the substance to work for a few hours. Some people may be concerned that the bleach will then also find its way into the waste water, which is not very environmentally friendly. I would agree, but have no solution to this issue. Be aware that the addition of 70% ethanol to the infusion will dramatically lower the concentration of the alcohol. You can add concentrated alcohol to the infusion but this is a cost issue (and the glass jar may not be large enough). Even pond water may be the source of some unexpected surprises. I recently introduced mosquito larvae into my household this way. The mosquitoes caused me quite some irritation at night. Be aware that keeping a jar of standing water may even be illegal in countries with Malaria, which can be spread by certain mosquitos. Other issues relate to the water quality of the pond water, may or may not be very high. Decomposing animals close to the sampling site can give rise to microorganisms that one does not want to have in the household. Ponds which are clean enough for swimming should not be problematic, there are rare cases, where people did get infected by certain protozoa, however. Water samples from ponds which are rich in (potentially irritating) Cyanobacteria or eutrophicated should be handled with more care. Some ponds may be close to agricultural areas and there is the possibility for manure to run into the ponds. Molds can be easily grown by treating an appropriate substrate (such as bread) with a soil-water suspension. Fungi will start to grow and release spores into the air. These spores may not only contaminate other types of food in the household, but may also be responsible for allergic reactions when inhaled. Many types of mold also produce potent toxins, which are capable of causing severe health problems. Prevent the spreading of spores by keeping the container with the mold closed and avoid air currents which may distribute the spores. If you want to investigate molds for educational purposes, then I would suggest that you try to first use edible molds, as can be found on foods, such as cheeses. Biofilms are composed of microorganisms that stick together and to a surface. They can often be found on objects that are moist. The slimy covering of rocks in a pond are an example. Biofilms that harbor bacteria from human sources (e.g. bathroom stoppers) may pose a possible health hazard, also because the bacterial density can be quite high. Harmful microorganisms can also be found on other places in the household, such as dishwashers. What does this have to do with microscopy? Microscopy enthusiasts should establish clear procedures when taking samples from these sources to prevent contact. Here is some general advice when handling samples that contain microorganisms. Open wounds: Do not handle microorganism-containing media if you have open wounds or cuts in your skin. Intact skin can be considered as a very effective physical barrier against infection and open wounds can be problematic. Disinfection: Disinfect hands and surfaces with 70% ethanol. More concentrated ethanol may actually work less efficiently in killing microorganisms. Disposal: Autoclave the used culture medium at 120°C for 30 minutes. This should also be able to kill spores. If you do not have an autoclave available, then cover the petri-dishes or culture medium with chlorine bleach. Allow sufficient time for these substances to work. When you add bleach, be aware that this is a corrosive substance when concentrated. Eye and skin contact must really be avoided. Also be aware that liquid bleach becomes more diluted when you add it to liquid culture medium, losing its efficiency. Avoid aerosolization: Some microorganisms spread over air. Avoid spillage of the culture medium and carefully add the disinfectant to the medium before disposal, avoiding splattering of the liquid. Keep bacterial counts low: Make sure that the sample (such as a hay infusion) contains many ciliates that consume the bacteria. Keep the level of nutrients low to avoid too many bacteria from forming and ensure that the medium has sufficient oxygen supply for the ciliates to grow. Do not use polluted water: Dirty and polluted water can contain contains many bacteria and a lower count of the more interesting ciliates. If the water sample was isolated from a stream that came in contact with household waste water, then it may be possible that pathogenic enterobacteria are present. Do not decompose food: Some teachers like to decompose food to demonstrate the spoiling process to children. Be aware that Clostridium perfringens may be found on spoiled meat or poultry. This bacterium can cause food-borne illnesses. Personally, I would not use microorganisms from spoiled food for educational microscopy. I would resort to much safer and easily available bacteria and fungi. These can be isolated from fresh cheese, or example. Do not culture bacteria obtained from humans: In particular, do not inoculate growth medium with bacteria from the skin. You may be growing Staphylococcus, otherwise. Keep petri dishes closed and sealed: This minimizes the risk of accidentally touching the agar surface, which may be covered by bacterial colonies. Generally speaking, I do not recommend the growth of unknown bacteria in petri dishes by people who do not have basic microbiological training in aseptic technique. The bacterial concentrations are simply too high to be safe. What is the take-home message? A good portion of common sense and basic hygienics will greatly reduce the possibility of you catching an infection and will hopefully keep you healthy. The Multitouch Microscope: The future of Microscopy?